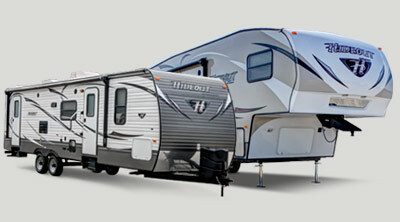 Keystone Hideout travel trailers were created for families who enjoy RVing together. Each unique floorplan was made with the families who might call it home in mind. With the Hideout, luxury truly comes standard. Each Hideout includes a range of features that are sure to impress any RVer. Whether you’ve got a large family or are a part of a couple, you are sure to find a floorplan that works for you. And, because we here at Moore’s RV are the #1 Hideout dealer, you can rest confident we’ll have something for you. Perfect for small and medium sized families, this floorplan can sleep up to 6 people. It features bunks in the rear and a queen sized bed at the front of the RV. Across form the dinette is a large kitchen that includes a three burner range, refrigerator, and double sink. The 268LHS accommodates 8 people and provides plenty of space for friends and family. It measures in at 29′ long. The exterior boasts a pull out camp kit. When you enter the RV you find a queen sized bed at the front, along with two closets. 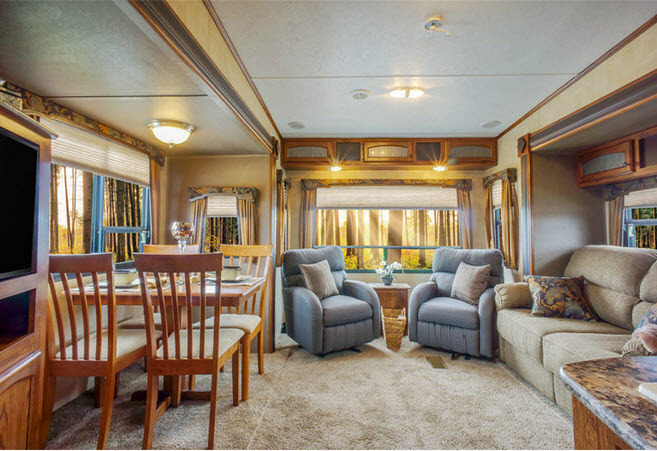 The living room slide comes with a U-shaped dinette and a 60″ jackknife sofa, while the rear of the RV includes a 32×74″ bunks. Ideal for big families, you’ll love the practical features of this RV. This 31′ travel trailer sleeps 9 people. The rear includes a double bed and a fold up bunk. An LCD TV that swivels 180 degrees faces the living room, but also make viewing TV in the front bedroom while sitting in bed possible. The living room slide comes with a large U-shaped dinette and optional tri-fold sleeper sofa. Generously sized pass-thru storage is positioned at the front of the RV. With enough space for 10 people, this floorplan was made to fit army sized groups. Designed to handle heavy traffic, the rear bathroom features an entrance inside the RV and one from the outside of the RV. 52×74″ bunk beds sit in the rear, while the living room slide includes a 72″ jackknife sofa and U-shaped dinette. If you’re interested in learning more about the Keystone Hideout travel trailers we have available, view our selection online or stop by to see what we have in person.